BIC was founded in 1945 and manufactured fountain pens and mechanical pencil parts. Since their invention of the first ballpoint pen in 1950 the company has expanded worldwide with a range of everyday simple, reliable essentials that everyone can use. The BIC range includes stationary, school & office markers, full range of children’s colouring and drawing products, correction products, Bic Wite-Out and Tipp-ex and stationary accessories. BIC products are available to consumers worldwide with 3.2 million retail outlets. BIC required a unique and innovative direct mail piece to drive traffic to their website to promote the launch of their new online shop. They wanted to engage with their customers and inform their target market of the simple and efficient online ordering process of their product range. In addition, BIC wanted to draw the attention of their promotional offer and competition with a clear and compelling call to action. 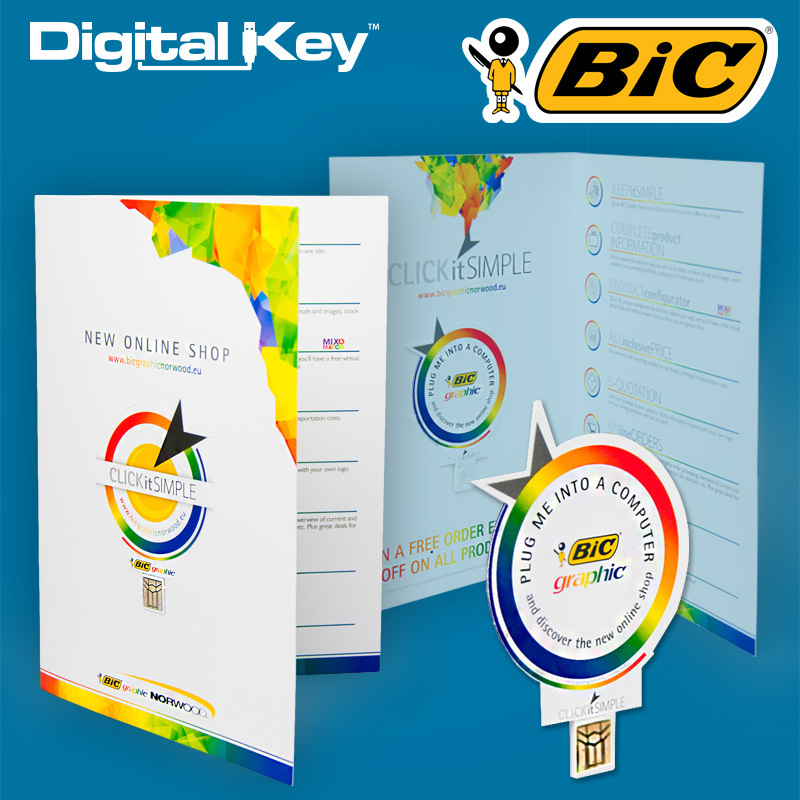 Amstore Innovation and BIC worked together to design, create and produce a custom designed A5, 4 printed page Digital Key brochure. The customised web key displayed a clear CTA encouraging customers to plug the USB into a computer to discover their new online shop.